Habit: Sideroxylon americanum grows as a large shrub to small tree up to 12 meters in height. The leaves are arranged alternately, to 10 cm in length, variable in shape from obovate with a flat or rounded leaf apex to elliptical with an acute leaf apex. The leaf margin is entire. The adaxial surface is dark green and glabrous and the abaxial surface is covered with reddish tomentose pubescence. The hairs on older leaves are often missing. Short branches often occur as spines. The actinomorphic, complete and perfect flowers are arranged in groups of 2-9 arising in the axils of leaves. 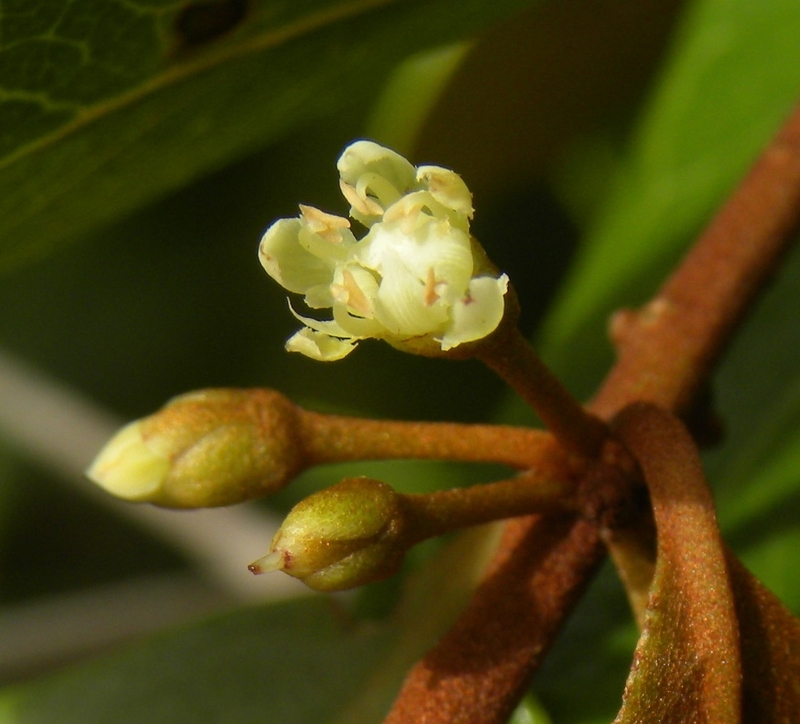 The calyx has 5 unfused brown pubescent sepals. The corolla has 5 white fused petals. There are 5 stamens fused to the corolla and numerous staminodes. The ovary is superior with 1 locule and seed. The fruit is a purple/black drupe at maturity that has milky latex. Habitat: Sideroxylon americanum grows in Dry Broadleaf Evergreen Formation – Forest/Woodland/Shrublands (coppice and scrublands). Distribution in Bahamas/Globally: Sideroxylon americanum grows through out the entire Bahamian islands as well as Cuba and Jamaica. Medicinal/Cultural/Economic usage: Sideroxylon americanum is used in the Bahamas as a tea to treat afterbirth in conjunction with Amyris elemifera (White Torch).